Near Montreal, Canada, the sweeping contractor owner of Balais Nomad Sweeping developed an innovative set of heavy duty gutter broom add-on segments that extend bristle life, take a load off hydraulics and aggressively scrub caked-down material and eliminate weedy curblines. Now these patent-pending broom segments are in use and being praised by over 40 cities in the U.S. and Canada. Christian Robertson's sweeping company, Balais Nomad Sweeping, needed a weeding brush to respond to customer requests for weeding curbs. The available 'weed attack brushes,' which consisted of large steel cables, were too heavy and did not do a clean sweep. That required us to do a second pass with a standard gutter broom to get the curb both weeded and clean. "Wouldn't it be great," he thought, "if we could combine both a weeding brush and the cleaning power of gutter brush?" That line of reasoning eventually gave birth of the company's Piranha gutter broom attachment. The Piranha is a segmented brush that is attached between the drive plate and the curb broom's brushes. Piranha, which is a patent-pending design, is constructed of small, cold-compressed and specially formulated steel cables. The secret to the design, says Robertson, is that the cables are small enough to go into the gap between the asphalt and the concrete curb. Piranha doesn't simply cut the weeds; rather, it attacks them at the roots. "The Piranha brushes worked fine all the time in any curbline. Wherever there was heavier material the brooms broke it up better. The stranded wire bristle sets go on easily and worked exceptionally well to do curbline sweeping. "However, because another Crosswind experienced a PTO fire, this sweeper ended up on a route where 60% of its sweeping was open space cleaning in cement, aggregate and scrap plants, uses for which the Piranha is not designed. "In that usage we had some problems with 'skipping,' leaving some material trails, on open areas without resistance of the curb. This occurred only during the open space usage where we typically use curb brooms to break loose caked-down material in open lots. And, on the open lot sweeping some of the bristles started to unravel. We knew this wasn't what the Piranha was designed for, though. "We used them enough to confirm that the Piranha did reduce curb broom wear rate and they are certainly heavier duty. We found them to be well applicable for anyone doing curbline sweeping, especially anywhere that has problem vegetation. Unfortunately, due to unrelated mechanical issues on this Crosswind we regret that we couldn't, as requested by WorldSweeper, derive prior to press time the additional number of hour miles and curb miles the Piranha brooms provided. Compared to using a traditional cable-wrap broom, because the Piranha segments are light they provide a heavy duty brush that puts less stress and strain on sweeper hydraulic systems and gutter broom arm joints and bushings. Wonder if they will fit your sweeper: The segments are universal and will fit on all bolt-on type gutter brushes. This reduces the need for additional inventory space needed to stock them for each sweeper type in a fleet. Weeds are a bane of sweeping contractors everywhere and a burden because they have evolved to survive. Weeds quickly grow to maturity and spawn seeds for now, for emergence later in the season, and to lie in wait as dormant seeds for next season when the conditions are right to germinate. To date, says Robertson, the company has sold its product to a total of 40 cities, all of which have reordered as needed. These include some cities that have traditionally used Glyphosate-based herbicides. They are now using Piranha broom segments as a mechanical alternative to dumping potentially dangerous chemicals in the environment. Piranha is a better choice, according to Robertson, since herbicides have no effect on weed seeds but only selectively kill emerged weeds. The Piranha, by contrast, aggressively removes the roots of weeds, even those embedded in pavement cracks. "Cities currently using Piranha brushes year round on their sweepers practically eliminate the conditions needed for weeds to grow," said Robertson, by emptying the gap between the asphalt and concrete curb. Piranha removes potential seeds and future generations from ever germinating. "When we designed the Piranha attachment it was to address the weed problem. However, once in use we found another very important advantage to using Piranha: because the bristles are very rigid, the Piranha bristles hold those on the gutter broom up. 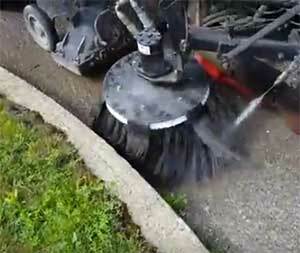 As a result, the curb/gutter brush only wears on its tips. Our inhouse testing and customer testimonials show that use of Piranha prolongs the life of gutter brooms up to 3 times normal life expectancy. Piranha does the heavy work while letting the gutter broom do the cleaning of fine particles." According to Robertson, use of his company's Piranha bolt-on segments saves more money than its original purchase cost when all factors are considered. To learn more, take a look at the embedded YouTube video linked below or go to the company's website. Below the video you will find a list of bullet points provided by Robertson that tout the positive aspects of his Piranha brush segments. Would you like to hear about the Piranha brush from the inventor? If so, click here to listen to an approximately 10-minute audio interview done with Christian Robertson (audio will open into a new browser window). Here is a list provided by the Piranha management that touts the positive aspects of the Piranha brush. • Piranha is a segmented attachment that is added to a regular bolt on gutter broom. The Piranha is bolted between your regular gutter broom and the drive plate. A piranha brush segments gets installed at every bolt that holds the gutter broom in place. Typically 6 to 10 segments per gutter broom depending on model of sweeper. • Piranha is light but very aggressive. Piranha only weighs +/- 2 lbs each. The low weight reduces stress on hydraulics and joints on sweepers. Warthog type brush plates can weigh up to 80 lbs each. • Piranha is stiff and holds up the gutter broom extending the gutter broom life up to 200 hours of sweeping. Saving on inventory costs and brush changes. • Piranha has small wires that fit in the crack between the asphalt and the concrete border and clears it out. The brush eliminates weeds and grass at the roots therefore delaying the regrowth. • Piranha is universal! No longer need to inventory different types Warthog type disks. • Warthog type brushes are good at stripping the surface but lack the ability to do any finishing work. Many contractors have to have a second sweeper behind to clean up the mess the Warthog type brush didn�t clean. Piranha has solved that problem! Piranha being attached to a regular gutter broom which is designed to clean thoroughly is able to strip with the outer diameter of the disk and the inner gutter broom does the fine cleaning. • Municipalities sweeping year round with the Piranhas are seeing that there isn�t a weed season because they have cleaned up the edges all year and have essentially eliminated the conditions that promote weed growth. • Piranha makes your sweeper versatile and is able to deal with any situation it encounters of the spot. The sweepers can often clean up in one pass what typically would require several passes. This ability saves time and energy which equals money saved. • Piranha is the obvious choice for anybody requiring a heavy duty, 'does it all' brush.